This is the first day of a quick, two-day trip to the Adirondacks. I’m writing this from my hotel room in Queensbury due to an utterly disappointing day and premature exit from the backcountry. I hiked into “Pro Golfer” Pond. Since its not named on maps and the last portion is off-trail, I anticipated it to be lightly fished (it is). It contains Windfall strain heritage Brook Trout. There is a good, mostly flat trail, for most of the hike. After crossing its outlet stream, I looked for footpath. Finding none, I cross-countried in using my DeLorme Earthmate GPS for help. Its around a quarter of a mile from the trail to the pond. It was some of the toughest hiking in years…..lots of downfall, busting through the woods, hoping the float tube wouldn’t get pierced. I finally made it to the pond’s southern shore just after 10:00. I quickly found my first problem: the shoreline transitions from soft, wet matting to deep, thin mud….very difficult to get in with a float tube. Opposite on the north shore, I spotted a couple of rock outcroppings at the water’s edge and figured this is the place to go. So, I spent another 20 minutes or so skirting bogs, etc in the boggy, grassy outlet, climbing or ducking under more deadfall. When I got to the desired location, I was exhausted. Concerned about getting out; I actually considered a short rest, then heading out. I did make two discoveries, though. The first one was a beaten brush path on the north side of the outlet area. The second one was a canoe that someone had carried in. That suggested the “herd path” I’d understood to be there may actually be a reality. I finally put in the water around 11 am. I rigged up an intermediate line with a Denny’s Callibaetis Nymph and a mini wine/black Seal Bugger on the point. I had seen an occasional fish rise and that was encouraging. As I kicked out into the pond, I started a troll and then noticed something was following me. I maneuvered into a big circle and it kept following me. I thought Beaver or Muskrat, though I’d never known one to be this bold. This one was actually good size….over 2 feet. As I sped up, to put some distance, a trout wacked one of the flies. I was too busy trying to understand what was going on to care. I kicked over by the big rock where I’d put in. Whatever it was got closer and closer. It would stick its head out of the water every once in a while, then submerge and reappear a little closer. At one point, it was 10-20 yards away and I stood up. It submerged and darted off. I didn’t get a great look, but, it was fairly good size……a big, fat beaver or muskrat I thought. I pushed back into water and, within a few minutes it or another one came at me. I kicked back to the rock and contemplated options. I waited a while and then I realized there were at least 2 or 3 of these things out in the lake, peering at me every so often. 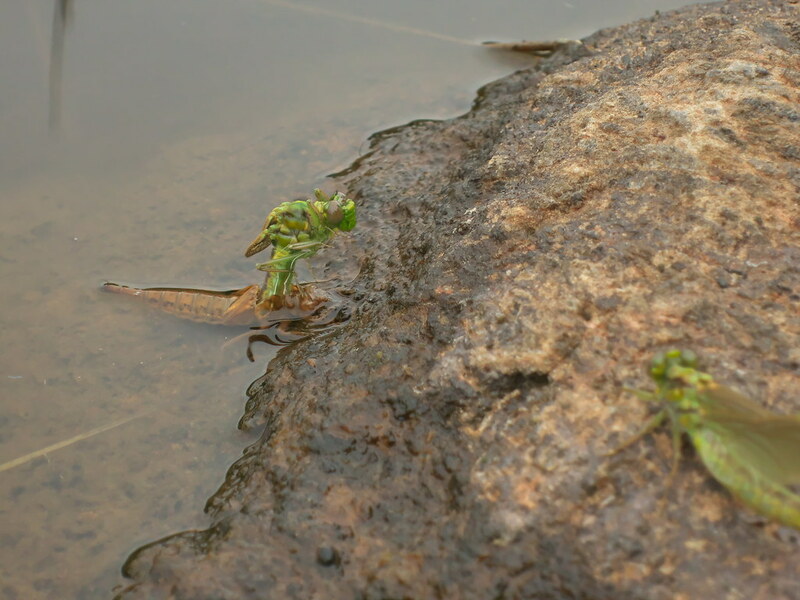 I also noticed several dragonflies in the process of emerging. I decided I’d kick back out into the pond and if this beaver/muskrat got too close; I’d douse it with bear spray. As I kicked out, I heard a noise from the outlet area: the owner of the canoe, I’d stumbled across earlier had arrived. I kicked over to him for some info. He asked me if I’d caught any fish. I responded, “I really haven’t had a chance to fish. There is something in here which is chasing me. Are these beavers or muskrats?” He responded, “No, they’re snapping turtles….and there’s big ones in here.” He indicated they like Brook Trout, particularly on stringers and they’ll come right up to the boat. I asked if he thought they might be dangerous to a float tuber. He responded, “I’ve never been bitten by one, so you should be ok.” He also indicated he’s been fishing this pond for 3 decades and the trout get up to around 18 inches. He also told me the location of the foot path out. So, I thought I’d have a go at it. I’ve fished in lakes with turtles before, but, they’re smaller and when they approach any movement sends them scurrying. But never have had any experience with big ones. By this time, it was 12:30 or so. I kicked away from him and started a troll. About 30 seconds later, a big turtle wacked and grabbed my right fin. This guy was big….over 2 feet. I thrashed, hooted, and hollered. After one or two seconds, he let go. That was it! I’d had enough. It could’ve easily grabbed my foot in the fin or ankle. I quickly kicked over to shore, had some lunch, and left. I managed to find and follow the footpath out which really helped. Even so, by the time I reached the Jeep; I was dragging. Total hours spent at pond: 4. Total fishing time: 5-10 minutes. 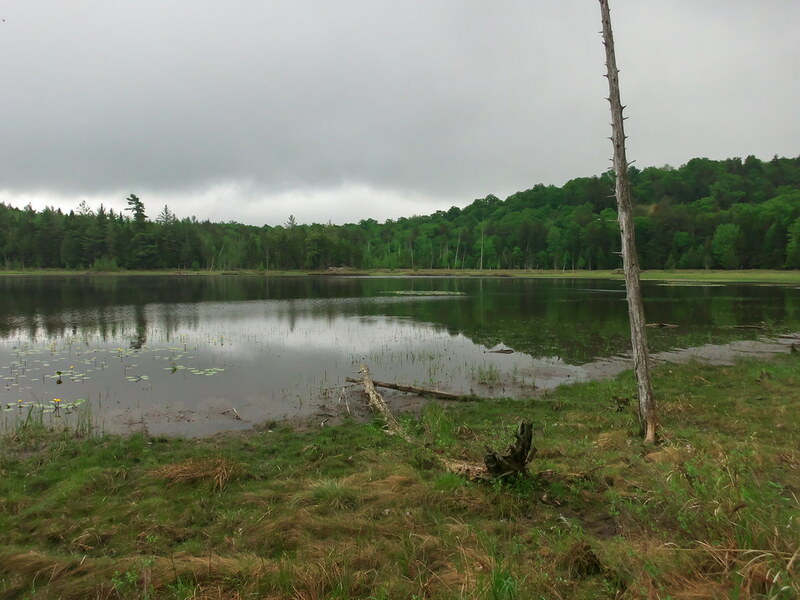 Tomorrow, depending on how I feel; the plan is to hike into either “Flat Hike” Pond in search of Little Tupper strain Brook Trout or “TSX Bullet” Pond as a shorter option. Man I got goosebumps reading your post. Glad you made it out unscathed. Black flies are bad enough this time of year without having to worry about something biting your toes off! I wouldn't be messing around with a large snapper. You were smart to leave. Now I guess my stupid question is how common are these large, aggressive, snappers in ADK trout ponds? I've never given a thought to being in a float tube and having to deal with something like this. This particular pond is between 10 and 20 acres and there were several in there. I did a tiny bit of research this evening and they are aggressive to anything they consider a threat. Wow intense reading! You had a very interesting day and you were smart those big snappers can do some damage!! I had a visual of some toes missing! I've often wondering if turtles, otters or beavers have bothered guys in float tubes....now I know. There has been many times that turtles have harassed us in canoes or jon boats. Big turtles and they most certainly try to get trout off our stringers while we're trolling. One day I caught 2 large snappers trolling, both times thinking I was hung on bottom. Quite the surprise when you lift straight up and think the "log" is coming to the top. Both times I saved the wabbler though. Seriously though, post of the year? Classic stuff. I would imagine they get larger than most books tell ya they do. Its not in the Adirondacks but outside of Rochester is Churchville NY and Black Creek which is very long and meandering and slow moving creek and I use to see snappers there close to 3ft across their back, have even handled dead ones there. We've had fish taken off stringers by snappers in Black Creek, where we use to sit on an old fallen tree and We found out the turtle hung out underneath it. When the stringer starts shaking you know something bigger than the fish you caught is checking it out. And here outside of Binghamton there is an old pond a 1/2 mile from here and we saw a couple years in a row one walking through the weeds in egg laying season that had a head that resembled a sheep. I don't know how heavy turtles like that are but certainly far above the 15 to 25lbs a book will state and far larger than anything you want to have taking a bite out of you. I guess they have their place in the eco system but when I see one ran over by a vehicle I don't feel bad whereas other turtles I'll stop and move them along. I do not blame you for deciding to leave... that would unnerve anyone. Just this weekend as I drove from the Hudson Valley to Western NY on Rt. 17 to 81 to NYS Thruway we must have seen well over a dozen snapping turtles that had been hit while crossing the roads. All different sizes. They are very active now as your story tells. Maybe they do get more aggressive when mating / egg laying season is on and the pond water temps rise. Two weeks ago I was on a bike ride in some farm country and came across a normal sized snapper crossing a road so I stopped with my riding friend and we moved it off the road in the direction it was heading. To show my friend the capability of the turtle to do damage I got a stick and moved it in front of its face. He was shocked at how fast that turtle struck at the stick and held on tight. The head can come way out and reached back as well. I showed him this so he would be aware for future encounters. They are nothing to take lightly. Especially the big ones. They are slow moving, but fast-striking and quite powerful. Additionally, since they are scavengers they are rife with bacteria. I would prefer a layer of kevlar, royalex or aluminum between a large snapper and me instead of pliable rubber...good choice to vacate. We used to catch them in a shallow lake in the Poconos and make turtle soup - largest we ever caught was 26 pounds (about 24" from front of shell to rear) and they deserve every ounce of respect when handling them. Cleaning one is a learning experience of how primitive their nervous system is...the muscles continue to contract hours after their head as been severed. You ever see Bioguide's videos where he's practically flying his hornbeck like a kite? It's a riot to watch him lift the thing over deadfalls with three fingers on one hand...someday I'm gonna own one of those. Big question is how do most of you get these up trails into ponds.....in/out in a day? I have a 12' Hornbeck and they come with a yoke. I installed some thick yoke pads and carry it on my shoulders. It's like wearing a big hat. It's actually quite comfortable and I've carried mine 6 miles over rugged terrain without issue. It's similar in weight to Bioguide's Placid Boatworks canoe. There was a lot of learning and tweaking to get the setup correct so if you're interested PM me and I'll take some photos. I've had the boat for 6 years. Hornbeck sells external frame packs that he modifies to carry the canoes. There are the best for portaging but I've found they are not big enough to carry my gear for my overnight trips. If you're just doing day trips this is the best setup for portaging in my opinion. There's always a debate about using a float tube versus a canoe. I also own a float tube and this is my second year using it. My two cents is that if you just plan on trolling, use the canoe. If you're a fly fisherman who casts and retrieves with a hand twist or similar the float tube is much better. The biggest pain in the a$% is the wind. Even the slightest breeze will push your canoe all over the place and this screws up your presentation. I've experimented with anchors, skegs, and drag chutes but it's just too much of a pain to right the canoe in the wind. The float tube allows you to hold your position and focus on your presentation. This doesn't include being attacked by a huge turtle like you just experienced though! That being said I've seen a recent post by a gentleman on this forum who caught some huge brook trout in what appears to be a kevlar canoe. I believe he did so with a fly rod so maybe there's some technique that gives the best of both worlds. I have fished with a guy who uses a native watersports kayak on ponds with cartable approaches, and the boat looks superior to my Radison for both casting and trolling. Admittedly, it is too heavy for carrying (as is the Radison). I have a tube, but everywhere I have used it I have had problems with the wind, and it is a LOT of stuff to carry in and out. I got out on Big Trout Pond in St Lawrence County with the tube, the wind shifted, and I thought I would be hiking back from the Sabatis end. Also, my wife had a fit with me when I returned, as she was not watching when I pushed back under the overhanging trees along the south shore to get out of the wind and kick back to her end of the pond, and she thought she was walking out alone to find the rangers! My wife and I looked at some recreational kayaks, yesterday at one of the big chains. Big question I had is how does one get a 36-40 lb kayak up a trail? Currently I carry the float tube on an external frame pack. Inside the pack are waders, air pump, fins, raingear, lunch. Flyboxes and loaded spools are in the tube pockets. Then I looked at the Hornbecks....14 lbs....for a 12 footer, is awful close to the float tube + fins + waders + air pump weight and almost 3x less weight than the commercial kayaks I've been looking at. Hadn't planned on that amount of money, but, they appear to be reasonable when compared with some kayaks in the same weight category. On these ultralights, I still don't quite understand carrying them in....everything I've seen in videos leads me to believe one end is dragging on the trail.....?